When: Mondays and Wednesdays from 7 to 7:55 a.m. beginning July 18. Program lasts five weeks. Where: Vail Vitality Center, 352 E. Meadow Drive, No.3, Vail. Cost: $350, includes use of facilities on training days for nonmembers. More information: Visit www.vailvitalitycenter.com, or call 970-476-7960. Why is golf performance training important? Why can’t you just go to the driving range and hit hundreds of balls until your swing feels good? Why can’t you just play rounds until you get your score down where you want it? The answers to these questions are complicated, yet simple at the same time. Golf is an asymmetrical sport, meaning that we are only working one side of the body. If you are an avid golfer, you have probably had your share of pain, including, but not limited to, shoulder pain, elbow pain, knee pain, back pain, ankle pain and hip pain. The reason for this is you are only focused on your swing and not the muscles used during your swing. To limit and eliminate pain, you must focus on symmetrical training, or training both sides of your body. Golf is a sport that requires many muscles to fire and relax at the same time. To be efficient, powerful and accurate, you must have your glutes activated, thoracic spine mobile, hips mobile, core stable and strong, ankles stable and shoulders stable. You also need to have ample full-body flexibility to execute and a good, consistent golf swing. In a good golf swing, you load the posterior chain, especially your back, leg and glutes, during the back swing and then use the energy stored there to create force on the downswing. Then you must decelerate that swing on the follow through. If thoracic spine and hip mobility are compromised or limited, you will always struggle to be consistent on all parts of your golf swing. If your hips are tight, you will tend to have, or end up with, back pain on a normal basis while playing the sport you love. 1. Mini band touchdowns (thoracic mobility): Use a circular mini-band and place it around your hands. Start with your arms above your head and your palms facing away from your face. Pull the band down and apart until it is behind or below your head; raise back up under control. 2. Dirty dog (hip mobility): Start on all fours (hands and knees). While on all fours, keep your knee bent and spine parallel to the ground and raise your leg laterally under control. Lower under control, and repeat on the other side. 3. Plank (core stability): While on your hands or forearms with legs extended behind you, focus on keeping your body/spine flat while engaging your glutes and tucking your belly button to your spine. 4. Single leg RDL (eccentric glute/hamstring/lower back strength): Standing on one leg, hold a dumbbell in the opposite hand. With a slight bend in the knee of the leg you are standing on, hinge at your hips, focusing on keeping a nice flat back, the raised leg straight and hips parallel to the ground. 5. TRX row (shoulder stability/strength): Keep your body flat and pull yourself in until your hands reach your ribcage. Lower yourself under control to your starting position, focusing on keeping your shoulders retracted. 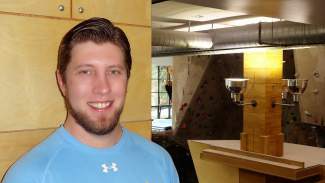 Blake Gould is a Vail Vitality Center professional trainer and rehabilitation specialist. He holds a degree in sports and exercise science from Briar Cliff University in Sioux City, Iowa, with a minor in psychology, and is a certified strength and conditioning specialist and Ignite360 master trainer. For more information about Vail Vitality Center programs, visit http://www.vailvitalitycenter.com.